The TX-1000 features a full color graphic LCD screen which displays your sound list or sound categories. It also has a barometer indicator, moon phase indicator, temperature indicator, battery level indicator, timer or time clock, FOXBANG technology and much more. FOXMotion allows you to fade the sound from the left speakers to the right speakers to help sell the reality of your call sounds. FOXFusion allows you to mix and match any two sounds at the same time during your calling sequence. FOXPitch allows you to manipulate the pitch of the sound in an effort to trigger a response. FOXData allows you to record real time information from each and every stand so you can access the data for future reference. 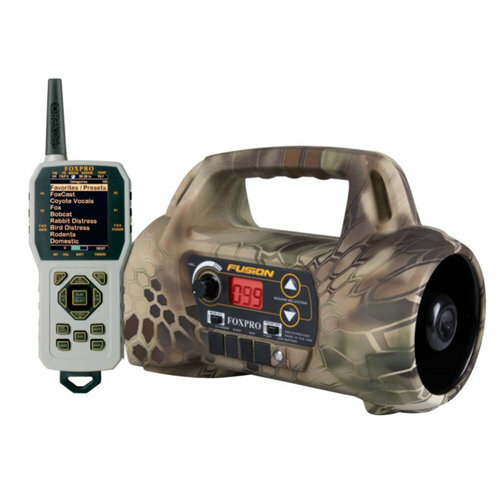 The FUSION is available in FOXPRO Skull Camo and is backed by a 5 year limited warranty and FOXPRO's unmatched customer support and is proudly made in the USA. The Fusion is available in FOXPRO's Skull Camo and Kryptek Highlander Camo finish.